I know some of you take Omega-3 supplements daily. My husband does too, but it's always been in a capsule form. When I asked him if he'd like to try a liquid form he said, "Are you crazy?" :) I told him it said it tastes good, he was skeptical. Well we got it, and he tried it (after looking at the bottle a few days...I guess working up his nerve) and he liked it. The flavor is not at all unpleasant, in fact you are supposed to refrigerate it after opening it, and he said he likes to take his spoonful when it's cold. You only take it once a day, and so far (after three days of using it), no fishy burps (common w/the capsules). This is a different way to get an Omega-3 supplement, and is especially fantastic for those who don't like to, or have a hard time swallowing pills. I think that's what I like most about it. 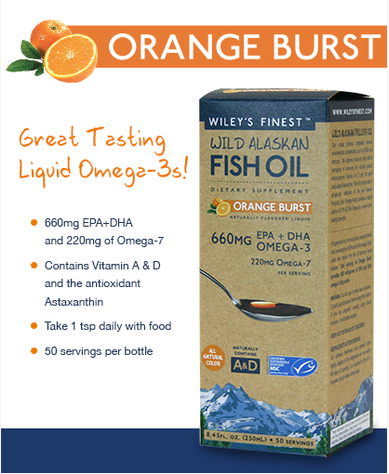 The Wild Alaskan fish oil is naturally orange, and derived from sustainable Alaskan fish caught by American fishermen. · Take 1 tsp. per day; 8.45 fl. oz. bottle is a 50 day supply! Being a fish oil in liquid, it seems intimidating at first, but I tried it this morning, and it's not bad at all! Definitely not fishy tasting, which is what I guess I expected, even though my husband told me otherwise. How about you? 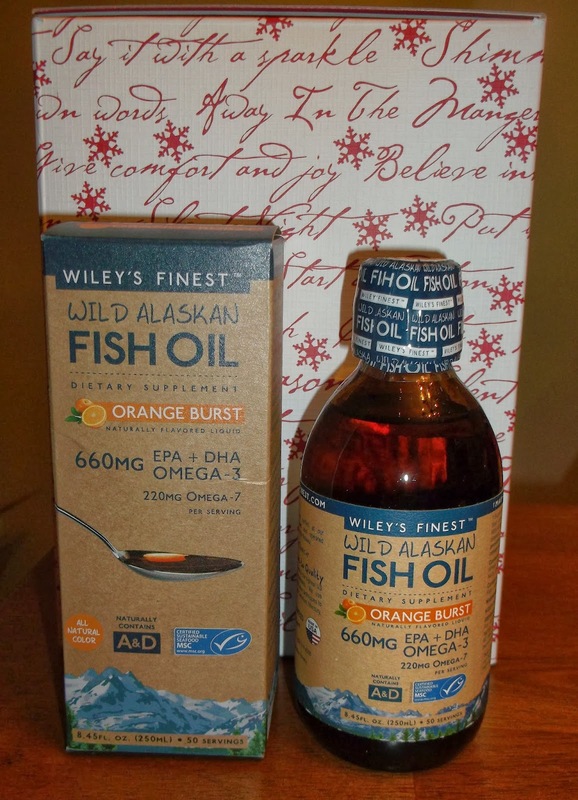 Would you consider a liquid form of Alaskan Fish Oil? You can learn more about the product by visiting the website. You can also follow them on Facebook and/or Twitter. Yes, I would definitely consider a liquid. Seems like it works just as well. Thanks for the great info. I think a liquid would be much better! I love the effects of fish oil! I have never tried a liquid, but would definitely consider it. I'd try the liquid! I'm starting my blogging break for the holidays tomorrow Rosey so just wanted to wish you and your lovely family a very Happy Christmas! I'm going to have to tell Chris about this. He takes a fish oil supplement, so I wonder if he would want to try this. It's something different. Love that this is a liquid. The pills I take are HUGE. I used to take fish oil all the time. Now that I have pretty much healed, I don't take it any longer. I probably should start again. Yeah! No fish burps. Maybe my kids will actually take this one. I was making all kinds of faces as I was reading this post☺ But maybe someday I will get brave and try it. Merry Christmas to you. This is a great way to get your fish oil. I'd not heard that it came in liquid until right now. Way cool. I like the liquid versions too. I still take some, but I heard eating the actual fish is better for you. Oh I'm glad you reviewed this because I've been needing a fish oil but haven't liked any of the pills so far. I don't eat seafood at all so this is needed! Oh wow. I would have liked to review this product as well. 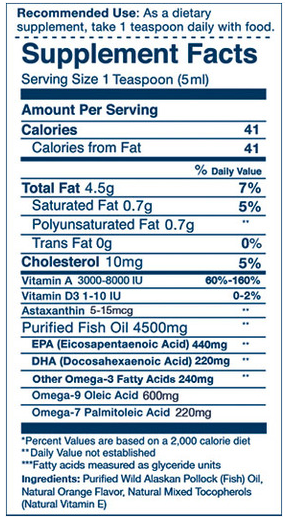 We took all kind of different fish oil, but I like this one and what it contains. I use to take fish oil tablets and need to start taking fish oil again. If it doesn't taste bad, I think it would be more fast acting taking it in liquid form. That's great that it tastes good. I would also have the impression it didn't taste good just on appearances alone. And no fish burps is a bonus! I take the capsules too, and those burps are gross! Thanks for reminding me that I have been so BAD about taking my vitamins and fish oil! I'm surprised to learn that it has a pleasant taste!! Oh I hate fishy burps! I couldn't at all do it when I was pregnant, I opted for the Omega 3 gel capsules. But if this stuff tastes good, I'd probably give it a try! Fish oil pills gave my husband horrible burps and gas :) He had to stop taking them, I wonder if the liquid would be better. I will pass on the info to him! Yes I would consider taking a liquid Fish Oil Supplement if it had a nice flavor. I definitely would not like to take a supplement that tastes horrible. Thank you for this review. no clue that it was in a liquid form .